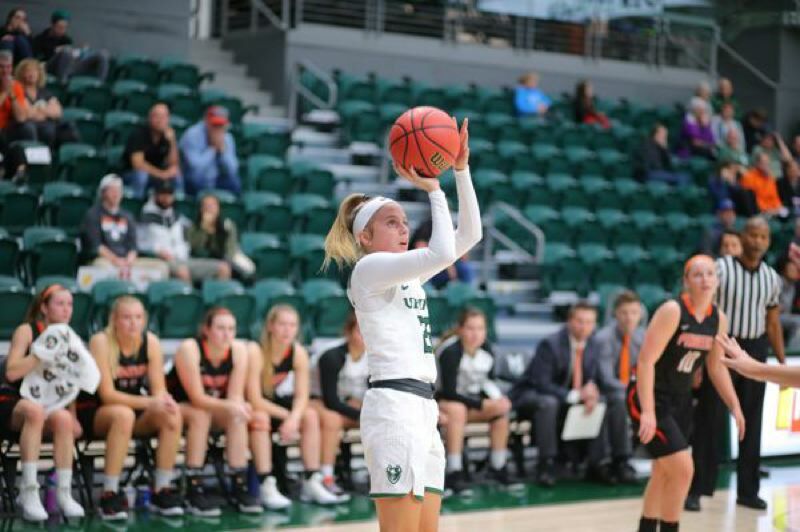 The Portland State women's basketball team is in the mix for a Big Sky championship because a strong group of seniors are battle-tested. The veterans came through in an important 85-66 Saturday win over Northern Colorado that left both teams 9-3 in conference, one game back of first-place Idaho. But younger Vikings are stepping forward, too. Sophomore point guard Kylie Jimenez leads the team in minutes with nearly 36 per game. As an extension of the coaching staff, she rarely comes off the court. "She's one of the best point guards in the league," PSU coach Lynn Kennedy says without hesitation. "She's so poised. She's starting to see what we see as coaches, and starting to understand what we want to get out of the game. She's hard to stop." Kennedy says he knew Jimenez would be perfect for his up-tempo system the first time he saw her play. Even as a sophomore at Horizon High in Thornton, Colorado, Kennedy could see her tormenting defenses at the college level. "She just had a way about her," he recalls. "As a point guard in our system, you have to be unique. You have to be able to break people down. You've got to be able to attack on the fast-break. You've got to be able to hit outside shots. You've got to be able to handle pressure. You've got to be able to play defense. She can do everything." The 5-6 Jimenez is among the Big Sky's leaders in steals, assists, assists-to-turnover ratio, 3-pointers made and 3-point percentage. "She does so many great things for us," Kennedy said after Jimenez had 15 points, five assists, three rebounds and a steal in a 74-58 win Feb. 7 over Sacramento State. But those numbers don't completely explain Jimenez's value. She can be a one-person press break, as she was when Sacramento State, which plays a full-court style, tried to double-team her in the back court. Basketball has been Jimenez's passion from a young age. By the fifth grade, she had given up soccer and softball to focus on playing for a traveling club basketball team. Jimenez comes from an athletic family. Her mother, Karla, played basketball at Fort Hays State, a NCAA Division II university in western Kansas. Her father, Steve, played baseball there. Her sister Aly, a high school senior and taller than Kylie, has committed to play women's basketball at Nevada. Leadership has been a point of emphasis for Jimenez during her second season at PSU. While the Vikings have four strong seniors, the point guard is an extension of the coach. "As a point guard, it is your job to be more vocal," she says. "I am more shy off the court so that can be tough, but I've been working on it." Jimenez says Kennedy's style of play, her relationships with the coaches and the opportunity to play in the Viking Pavilion are reasons she came to Portland State. It didn't hurt that Kennedy was the first college coach to offer her a scholarship. Jimenez isn't the only young player contributing on an otherwise veteran Vikings team. Freshman Desirae Hansen, a 6-0 guard from Rainier, is averaging 20 minutes and team-best 43.2-percent shooting on 3-pointers. "For her to come in and contribute says a lot about her commitment to the game," Kennedy says. Against Sac State on Feb. 7, with PSU's depth a bit strained by several nagging injuries, sophomore forward Savannah Dhaliwal from Surrey, British Columbia came off the bench to score 10 points in the second quarter. She had scored 25 points and made eight baskets over her first 15 games this season — then went 5 for 6 to keep the Viks even with the Hornets in the first half before they took charge for the 16-point victory. "She does that in practice all the time," Kennedy says. Close losses at Idaho and at home to Idaho State — games Kennedy admits PSU should have won — kept the Viks from rising to the top of the Big Sky standings. But those outcomes haven't damaged the team's confidence or goals. "I think we bounced back from our losses pretty well," Jimenez says. "We know that come tournament time we'll see these teams again. Knowing we've been right in every game we've lost helps." The Vikings will need to take that confidence with them the next two weeks for four consecutive road games. PSU plays six of its final eight away from Viking Pavilion, beginning with games Thursday at Northern Arizona and Saturday at Southern Utah. • Ducks and Beavers will tangle three times in four days this weekend. The men's game, 6 p.m. Saturday at Gill Coliseum, features teams separated by one game in the Pac-12 after Oregon's sweep of the Bay Area schools and Oregon State's split. The Ducks, who will try to avenge their loss to the Beavers on Jan. 5 at Matthew Knight Arena, have won four of five to get to 6-5 in conference. The Beavs have won three of four and are 7-4 in the Pac-12. The marquee games, though, are the top-10 women's basketball battles at 6 p.m. Friday in Eugene and 6 p.m. Monday in Corvallis. The Ducks roll into the Civil War games with a two-game lead in the Pac-12 after obliterating Stanford on Sunday. They ended a string of 29 losses at Maples Pavilion with an 88-48 victory. Oregon (23-1, 12-0 Pac-12) leads second-place Oregon State by two games with six remaining, meaning a split of the Civil War series probably wraps up the regular-season conference title for the Ducks. Oregon coach Kelly Graves called Sunday's performance the best defense his team has played in his four seasons guiding the Ducks. If the highest-scoring women's basketball team in the land can be that good on defense, how high might these Ducks fly? The Beavers, though, have lofty goals of their own. A confident Destiny Slocum (49 points over two games in the Bay Area and four consecutive games of at least 20 points), is leading the way. Expect an intense couple of games between these rivals. • The Multnomah men are within reach of the Cascade Collegiate Conference playoffs after a stirring win on Saturday at Eastern Oregon — without star guard Justin Martin. Martin, the leading scorer in NAIA Division II, missed the Lions' games at College of Idaho and EOU with tendinitis and fluid in his right knee. Coach Curt Bickley says Martin might be able to return for this week's home games against Evergreen State and Northwest that conclude the regular season. Two wins would clinch a CCC playoff berth — the program's first. One might do it, too. Multnomah, Warner Pacific and Northwest are 5-11 in conference play. Two of those three will make the playoffs. Northwest visits Warner Pacific on Friday and Multnomah on Saturday, with Evergreen (1-15) at Multnomah on Friday and Warner Pacific on Saturday. Zach Richardson, a 6-0 freshman from Seattle, helped the Lions weather Martin's absence. He had 15 total 3-pointers at C of I and EOU, scoring 42 points and playing all 40 minutes in Saturday's 112-105 win at La Grande. "We had to have him step up, and he did," Bickley says, noting that Richardson and Martin have become good friends who spend hours in the gym together. Also stepping up were seniors Brett Blackstock and Ben Grandle. Blackstock, playing point guard for the first time, had 23 points, seven assists and only three turnovers at Eastern Oregon. He hit four foul shots late to secure the win. Grandle made 9 of 14 3-pointers and scored 30 points against the Mountaineers. Three of Grandle's 3's came when the Lions hit from beyond the arc on five consecutive possessions to rebuild a lead after the game was tied 62-62. • The Warner Pacific women have locked up a conference tournament spots heading into this week's final home games. The Knights are 9-9 in the CCC and in sixth place. Multnomah, 6-11, is ninth but can move into a playoff spot with wins this week over Evergreen State and Northwest. • Concordia's men and women remain in contention for a Great Northwest Athletic Conference playoff spot with six games left in the season. The Cavaliers men beat Western Oregon and Montana State-Billings over the weekend to improve to 4-10 in league play. Heading into games Thursday at 19th-ranked Saint Martin's and Saturday at Seattle Pacific, the Cavaliers remain two games back of sixth place in a league where the top six teams make the playoffs. The Concordia women are tied for sixth with Seattle Pacific and MSU-Billings at 6-8 in the GNAC. A 60-57 Saturday win over fifth-place Western Washington (7-7) kept the Cavs in that tie. The Concordia women will play their next three games on the road, including this week's visit to the Alaska schools.